Old Quebec Street can trace its origins back 175 years, to founding of the City of Guelph. For decades, the space occupied by Old Quebec Street was an extension of the current Quebec Street, linking Wyndham and Woolwich Street. Today, Old Quebec Street stands proudly amongst the many historic buildings in the downtown area—although it is barely a decade old. Many Guelphites will remember the Eaton Centre as an earlier “version” of Old Quebec Street—the first step in its evolution. Construction on the Eaton Centre lasted from 1980 to 1984. During this time, the original Quebec Street was closed off for construction. But in 1999, Eaton’s went out of business and the shopping centre was sold back to the city. At the time, Guelph’s city council saw the need for a downtown hockey arena, to serve as a new home for the Guelph Storm. So the back half of the Eaton Centre was torn down, making way for the Sleeman Centre in 2000. Today, the Sleeman Centre serves as Guelph’s premier venue for sports and entertainment, standing alongside Old Quebec Street as one of the city’s main hubs for urban activity. 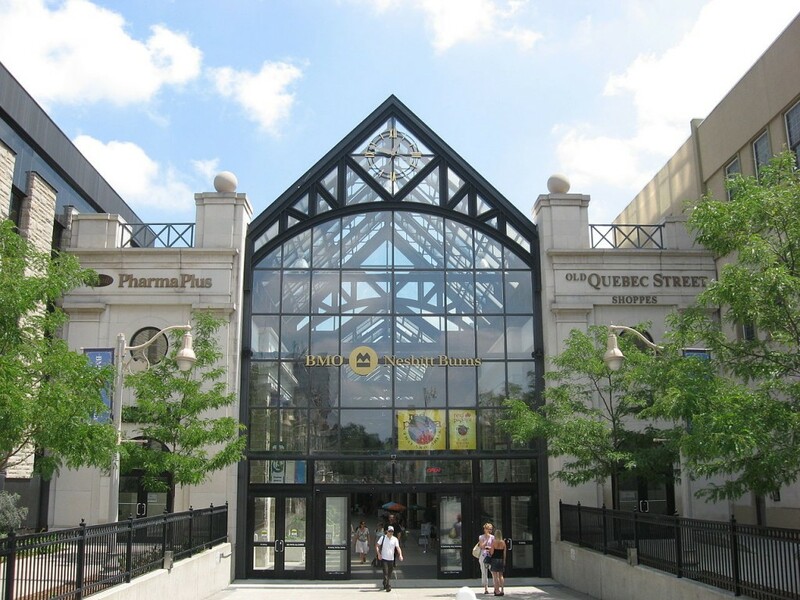 The remaining section of the Eaton Centre underwent renovations and re-opened in 2003 as Old Quebec Street, creating a new chapter in the story of the building. The lower levels of the building continued to be used for retail as well as restaurants, while the upper floors were converted into clinics, labs and offices. The exterior was also remodelled into its current glass facade, making it a recognizable landmark of Guelph today. Over time, many factors have molded Old Quebec Street into a unique shopping destination. Come visit our village in the heart of Guelph and experience the history for yourself!